This is the final version of the Smart Girl’s blouse for my “minus the sun, night all day” collection. The calico version is here. I have made the hem and sleeves slightly longer and the cuffs narrower to make it look “smarter”. I have used a textured stripe cotton fabric in pale blue for the main part and plain pale blue fabric for the breast pocket and cuffs. 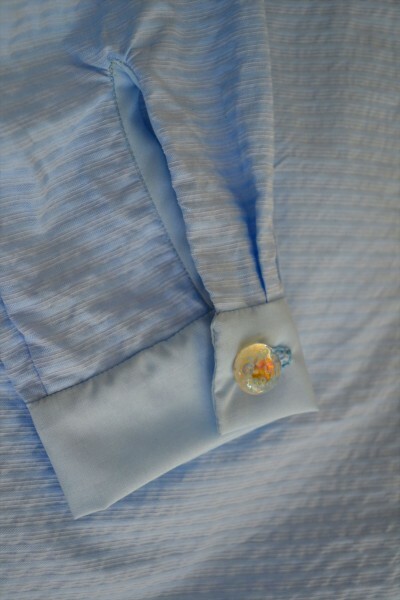 The special buttons made for this blouse. 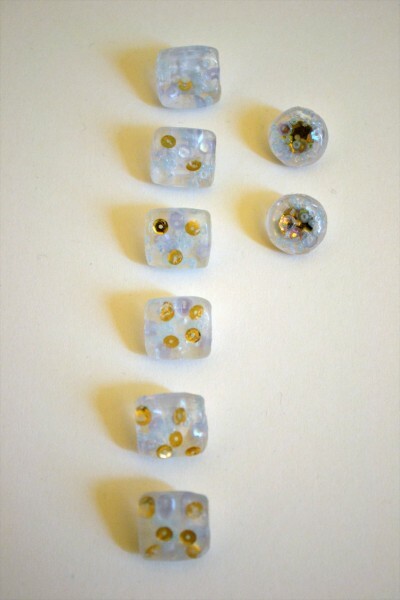 Sequins and beads in pale blue are inside the resin. The number of gold sequins inside each button matches the position of each. For example, the second button from the top on the blouse will have two gold sequins. The Smart Girl likes to count, you see. The square shape is perfect to go with the breast pocket’s story mentioned below. I wore it with my pleated skirt of my high school uniform here but I am planning to make my own pleated skirt to go with the blouse soon. The ladder lace section matches the running stitch on the breast pocket and the hem. 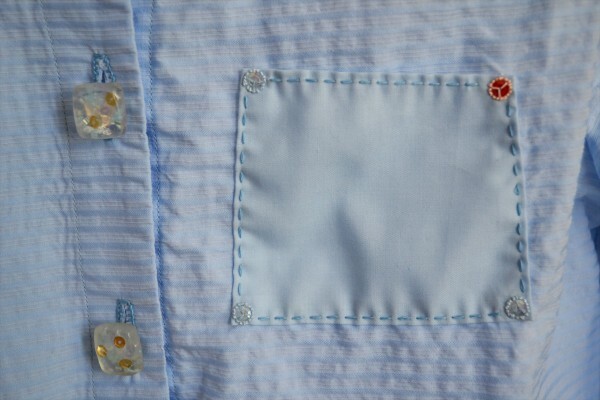 The breast pocket is in the shape of the Great Square of Pegasus. There is a sequin and French knots around it at each corner representing the stars. Like the actual stars that makes the square, three of the stars shine in white/blue and one shines in red. Running stitch joins the stars to create the imaginary lines in the night sky. You can see the hand stitched buttonholes in this image as well. The cuff’s fabric matches the breast pocket. Hard to notice, but there is a sequin and French knots representing a star at the hem of the left front bodice (opposite to the breast pocket side). 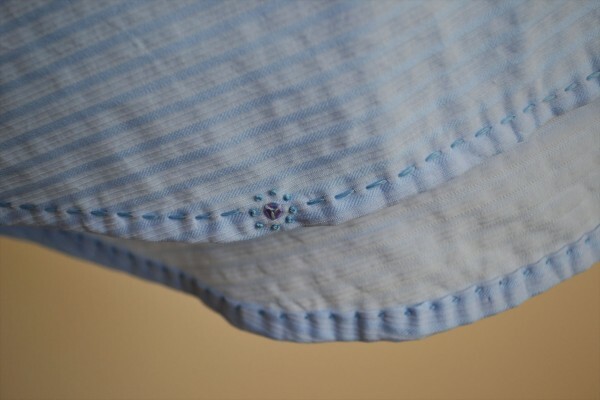 The hem is hand finished with running stitch representing the movement of this star. 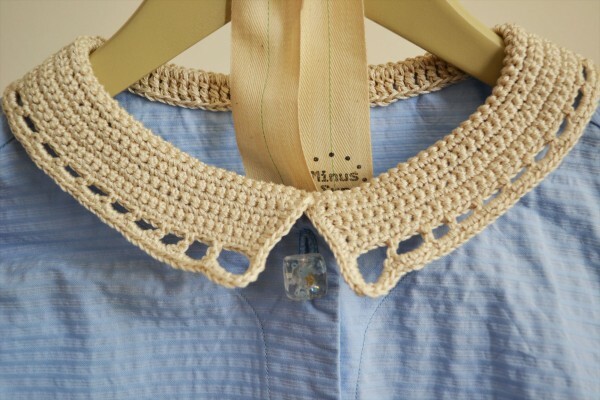 commissioned crocheted collar shirt dress final ver. 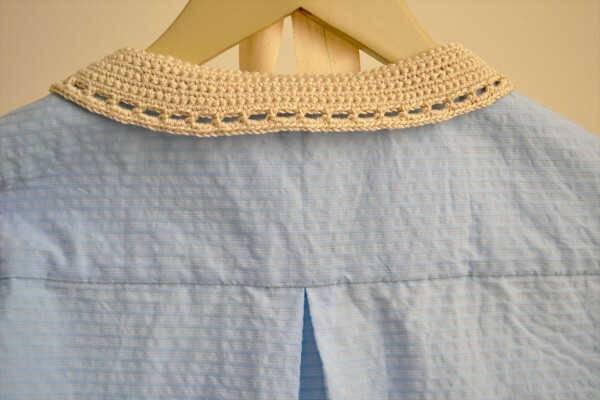 commissioned crocheted collar shirt dress calico ver. commissioned sailor collar dress final ver. the Suicidal Girl's dress final ver. the Smart Girl's shirt and skirt final ver. the Amusing Girl's top and skirt calico ver. 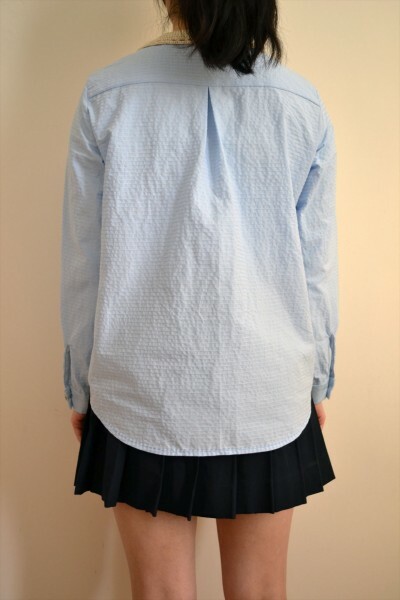 the Smart Girl's shirt and skirt calico ver. the Controlling Girl's shirt dress final ver. the Cultured Girl's dress calico ver. the Self-Conscious Girl's dress calico ver. the Controlling Girl's shirt dress calico ver. the Suicidal Girl's dress calico ver. the Passive Girl's dress and apron set final ver. the Passive Girl's dress and apron set calico ver. the Self-Conscious Girl's dress final ver. the Dreamy Girl's top and trousers final ver. the Dreamy Girl's top and trousers calico ver. the Amusing Girl's top and skirt final ver. the Solitary Girl's dress final ver. the Solitary Girl's dress calico ver. the Suicidal Girl's blouse final ver. the Suicidal Girl's blouse calico ver. 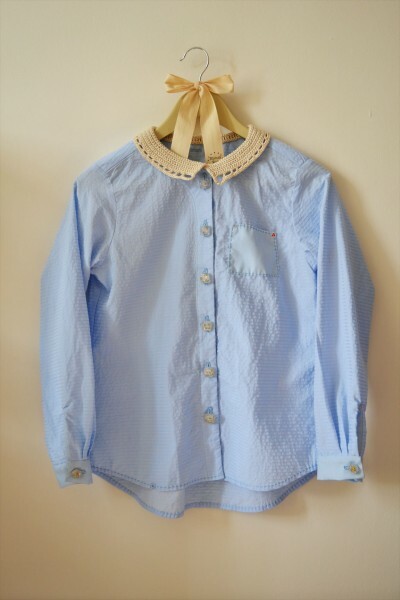 the Smart Girl's blouse calico ver.